During the summer months, I live for super fresh salads, bursting with the flavors of the season’s evolving produce. And right now I’m in peach mode, thanks to Harry and David and their sweet Oregold Peaches from the Pacific Northwest. Harry and David is known for their top-notch food gifts. And I can whole heartedly testify to that. When we received a box of Oregold Peaches from Harry and David recently, they proved to be everything I expected to experience. They were delivered right to our door, absolutely perfect and ready to eat. Their warm peachy scent is intoxicating, and their flavor and juiciness is sublime. We’ve been eating them straight out of hand, diced on cold cereal and yogurt for breakfast, and grilled for salads and desserts. They are simply heavenly. 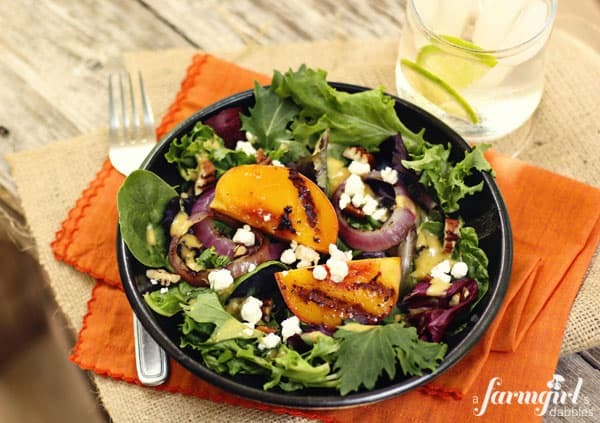 This Grilled Peach Salad with Peach Cumin Dressing gets an extra pump of summer from grilling the peaches and red onions. Grilling brings out another layer of flavor and texture, and adds to the beauty of the salad. I also whipped up an easy dressing using the fresh Oregold Peaches, to further pronounce the fruit’s goodness in the salad. The fresh ingredients take a quick whirl in the blender, and the dressing’s ready to go. Its flavor is warm from the peaches and cumin, and bright from the lime. I could drink this dressing. It’s so good! The salad is assembled on a bed of greens with a small handful of torn fresh herbs. Each time I create a summer salad, I take a little trip out to our herb garden for a random collection of flavors. It’s hard to believe how such a small gesture can impart such a big impact. 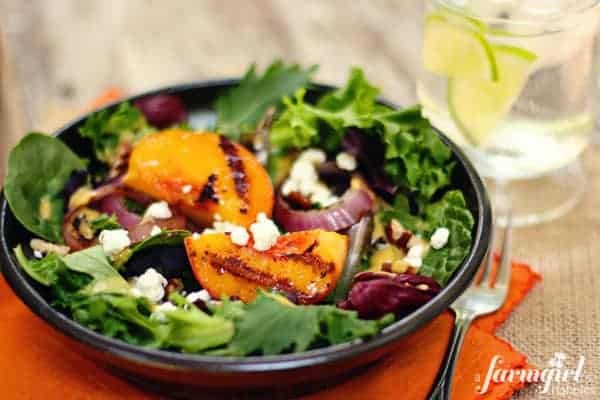 In this salad, I especially love how the mint mingles with the peaches, and the cilantro with the cumin and lime. They were just meant to be together. If you’re looking for a salad that relishes all this season has to offer, give this a try. It’s the perfect way to celebrate the goodness of summer at your table. Be sure to check back next week, when I’ll be sharing a grilled peach recipe in dessert form! Heat grill or a stove top grill pan to medium heat. Lightly oil the grates/pan. Brush the cut sides of the peaches and both sides of the onion with the olive oil. Sprinkle lightly with salt and pepper. Place peaches on grill cut side down, for 3 to 5 minutes, or until nice char marks appear. Flip and grill for an additional 3 to 5 minutes. Grill both sides of onion slices (don’t separate the rings) for 3 to 5 minutes on each side, or until nice char marks appear. Remove peaches and onions to cutting board. Cut peach halves in half. Cut onion slices in half, if desired, or just leave in whole rings, separating the rings. Place all ingredients in a food processor or blender and blend until smooth. This will produce approximately 3/4 cup of dressing. Double recipe for more dressing, if desired. This can be made several hours prior to serving. 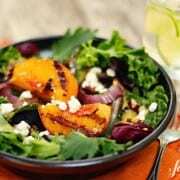 Toss the greens with mint and cilantro, and divide between 4 salad dishes. Top each salad with 2 peach slices, plus a bit of onion, almonds, and feta. Drizzle with peach dressing. Sprinkle with additional kosher salt and freshly cracked black pepper, if desired. Serve immediately. Oregold Peaches make a delightful gift. Surprise someone you know or treat yourself to peach gifts from Harry and David, and savor the goodness of sweet, sweet summertime. I’ll be hosting a peach chat on Harry and David’s facebook page tomorrow (Thursday, August 2nd) at 3:00 CST. I’d love for you to join me! This post was sponsored by Harry and David. But all opinions are 100% my own. Oregold Peaches are absolutely fabulous!